Welcome back to a regular installment of our Sunday British history lesson! Two weeks ago, we learned a bit about William the Conqueror‘s rule as King of England. after falling off his horse at the Siege of Mantes. His son Robert is left with Normany while his other son William Rufus inherits England. In 1088, William II suppresses a rebellion instigated by his own uncle, and the following year, he fights his elder brother Robert for claims on Normandy; he succeeds, and Big Bro is relegated to a subordinate position. 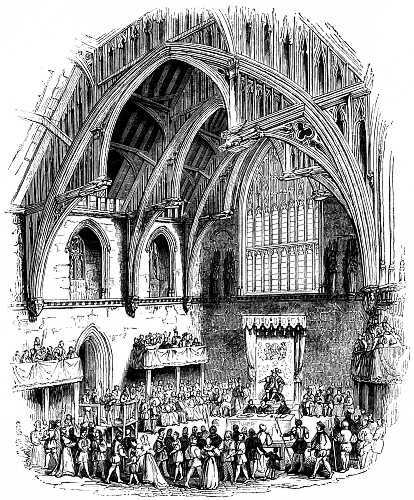 Just as William I gave us the White Tower of London, William II has left us with Westminster Hall, which was constructed in 1097 and still exists as part of today’s Palace of Westminster. Over the years William has managed to make himself unpopular with some in imposing a high tax in England, insisting overlordship above Scottish kings, and maintaining argumentative relations with the church. In 1100, he is shot by an arrow supposedly on accident while hunting; his death is suspected to be assassination under the orders of Little Bro, Henry, who assumes the throne as Henry I.